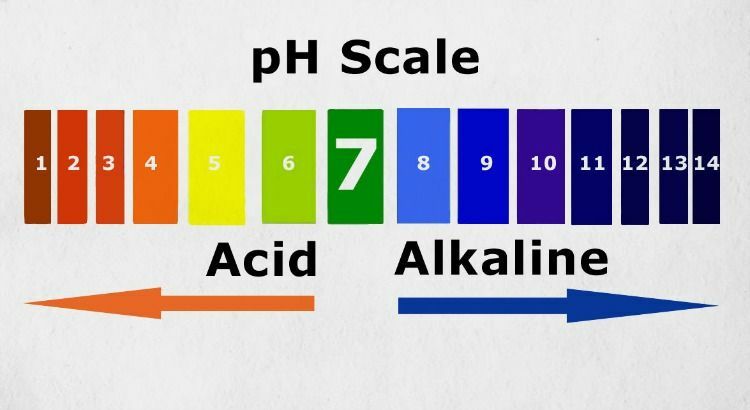 Is your diet “acidic” or “alkaline”? As you know, the foods you eat have a powerful impact on your health. Eating foods that are more alkaline can be health-promoting, as we’ll learn below. But that doesn’t mean you suddenly have to eat a “raw” or “vegan” diet, which is what we tend to think about when we think about eating highly alkaline foods. The truth is, eating alkaline foods doesn’t require any extreme measures. Eating high alkaline foods simply means you’re eating more of certain foods to help prevent your blood from becoming too acidic, which promotes your health in endless ways. In fact, among other things your body has a hard time properly producing energy in an acidic internal environment, as an acidic state leaves less oxygen available to your cells for energy production (1). It just so happens that the most alkalizing foods are plant foods, which makes them excellent food choice when you’re eating for energy. Therefore, eating energizing, alkaline foods simply means you’re eating more fruits and vegetables. What’s so crazy about that? Our bodies have what’s called a pH balance, which measures the acidity in our blood. That level can determine our overall state of health – and whether or not we’re at risk for serious illness. Our blood is measured on a pH scale that ranges from 0 to 14. Zero is considered most acidic, while fourteen is highly alkaline. The ideal pH of our blood for optimal health is around 7.35, which is neither too acidic or too alkaline, but neutral. The reason the acid-alkaline balance matters to you is because it directly impacts your state of health. Previously, the acid-alkaline diet was thought to be some crazy, vegan hippie myth. But even Dr. Otto Warburg, who dedicated his life to researching cancer cells, won a Nobel prize for proving that cancer cells cannot survive in an alkaline environment (2). As mentioned above, one of the primary factors that influence our blood’s pH are the kind of foods we eat. All foods can be categorized as acidic, alkaline, or neutral. A food’s pH isn’t measured by its physical properties, but by the residue that’s left in the body once the food has been metabolized. For example, we’d intuitively consider a lemon acidic because it has a sour taste and the ability to erode our tooth enamel. But once it’s been metabolized by the body, lemon leaves the blood alkaline. 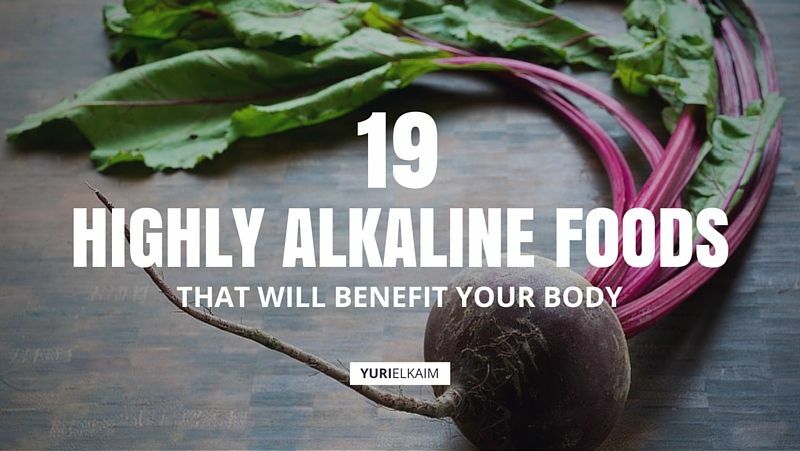 This explains why a seemingly acidic food can “turn” alkaline in the body. To determine whether a food is alkalizing or acidic to the body, each food is measured on a PRAL scale. PRAL isn’t the sound a dying cat makes – rather, it stands for the “Potential Renal Acid Load” of a food. Instead of simply categorizing a food as acidic or alkaline, PRAL measures the exact amount of acidity or alkalinity of a food once it’s been metabolized (3). 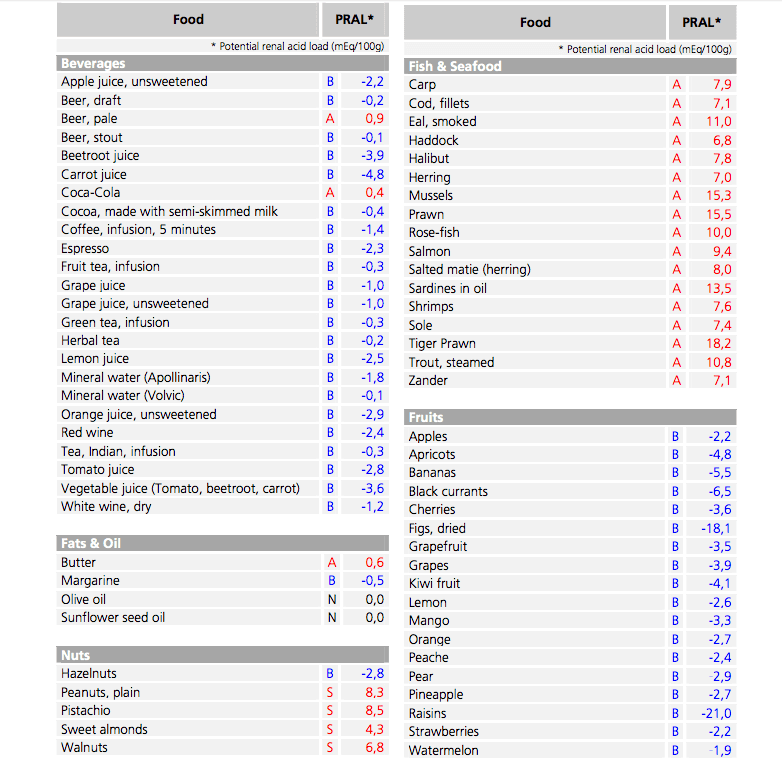 Each food on the PRAL scale scores in a negative, neutral, or positive value. Any food that has a negative value is considered an alkaline food (or a base), while any food with a positive value is acidic. For example, broccoli has a score of -1.2, which means it’s alkalizing – but not as alkalizing as eggplant, which scores at -3.4. Lean beef, on the other hand, has a score of +7.8, which means it’s highly acidic. To get a little more technical, PRAL measures the acidity or alkalinity of a food based on the amount of minerals, protein, and phosphorus that’s left behind in the body once it’s been metabolized. Since protein and phosphorus break down into sulfuric acid and phosphoric acid, they are considered acidifying to the body. When an alkaline food is metabolized, it will leave behind alkaline trace minerals, such as calcium, magnesium, and potassium. The foods that rank most alkaline on the PRAL scale are fruits, vegetables, and a few nuts and seeds. The foods that rank most acidic are the foods many of us eat each day, such as chicken, grains, eggs, peanuts, fish, seafood, and dairy products. In fact, I hate to be the messenger here, but parmesan cheese has a score of +34.2 on the PRAL scale, which classifies it as one of the most acidifying foods in our diets. Now, you may be wondering how dairy could be classified as acidic, seeing as how it contains calcium, which is an alkaline mineral. The reason dairy is acidic is because it contains much more phosphorus (which is acidic) than calcium (4). As a quick side note, how the PRAL table measures the acidity of a food isn’t to be confused with how our blood’s pH is measured. If we were applying PRAL scores to the pH scale, the 7.8 score of lean beef would suggest that it’s alkaline, or neutral. Unlike the pH scale, a food with a negative score actually means it’s alkalizing to the body. Make sense? 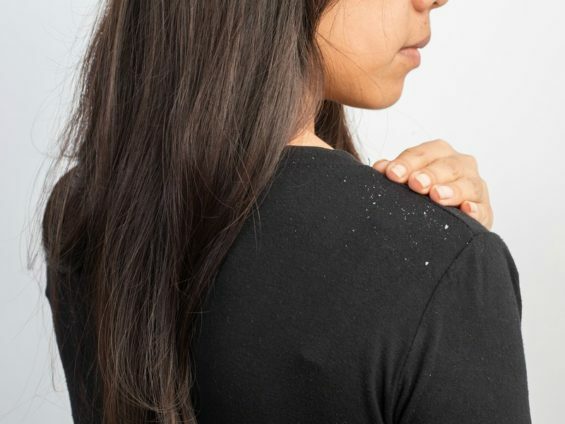 We’ve briefly touched on one of the most detrimental effects of an acidic internal environment, which is the encouragement of disease – specifically cancer. But being too acidic can come with other symptoms that occur far before a serious illness results. In fact, being too acidic can result in muscle wasting and reduced bone density. This is partially due to the fact that many acidic foods are low in nutrients that promote musculoskeletal health, such as potassium and calcium (5). 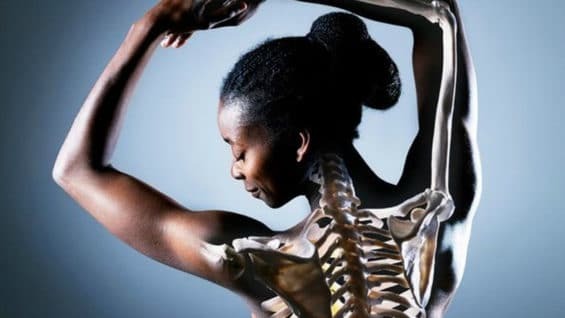 To get slightly more scientific in terms of bone health, an acidic environment has been shown to encourage the activity of osteoclast cells. Osteoclasts are cells that break down bone. 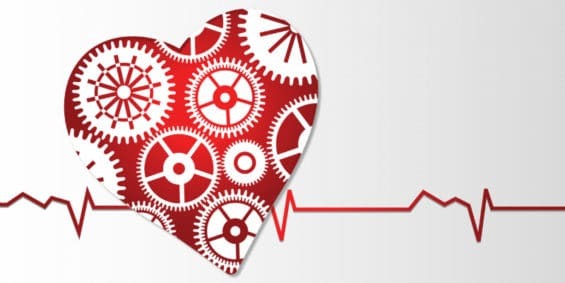 Now, the body contains natural compounds such as bicarbonate, that act as buffers to neutralize blood acidity. These buffers help prevent extreme drops in blood pH. This is an important defense not only against acidifying foods, but also against other factors that promote acidity in the body, such as chronic stress (7). Strenuous exercise can also promote blood acidity because it encourages the release of lactic acid from the muscle tissue (8). While your body has a natural defense system against having an acidic blood pH, it is possible for these buffers to get worn out over time – especially if several factors are present that negatively impact your pH, such as stress and a highly acidic diet. For this reason, it’s important to support your body by including alkaline foods in your diet whenever possible. This isn’t to say you must go raw vegan and eat only alkalizing fruits and vegetables for the rest of your life. While it’s rare, it’s still possible for the blood to become too alkaline. But since the modern diet is typically higher in acidifying foods, including alkalizing foods into your diet each day will help neutralize your blood pH and improve your health in numerous ways. Now, let’s go into more detail with this high alkaline foods list. Let’s give a round of applause to the world’s most alkaline food: beet greens. Although beet greens aren’t the most popular green in our diets, their high alkalinity score makes them one of the best additions to smoothies or stir-fries. 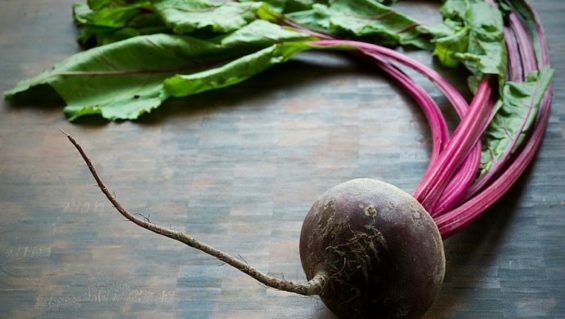 In addition to being high alkaline, beet greens also have a bitter quality that may help stimulate bile production to help better digest fats. If that’s not a good enough reason to hang on to your beet tops, I don’t know what is. Beet greens can replace any green in salads, soups or smoothies. You may want to try my Apple Cider Vinegar and Green Detox Salad recipe, where you can easily substitute the spinach, kale or watercress for beet greens. Spinach is another high alkaline food that is known to benefit bone health because of the calcium it contains. Because spinach is highly alkalizing, it’s often included in anti-cancer and cleansing juicing protocols. There are endless creative and delicious ways to eat spinach. I recommend giving any of these Easy Green Smoothie Recipes a try. Each smoothie only has 3 ingredients, with endless flavour combinations. There’s a reason kale has been labelled as the new beef. It’s high in plant iron, calcium and vitamin K, which is said to help protect against many types of cancers. In addition to these health benefits, kale is another one of the world’s most alkaline foods. Kale has a mild taste that can jazz up any recipe. You can easily add kale to any smoothie recipe that calls for greens, stir fries, salads and soups for a (delicious) alkaline boost. 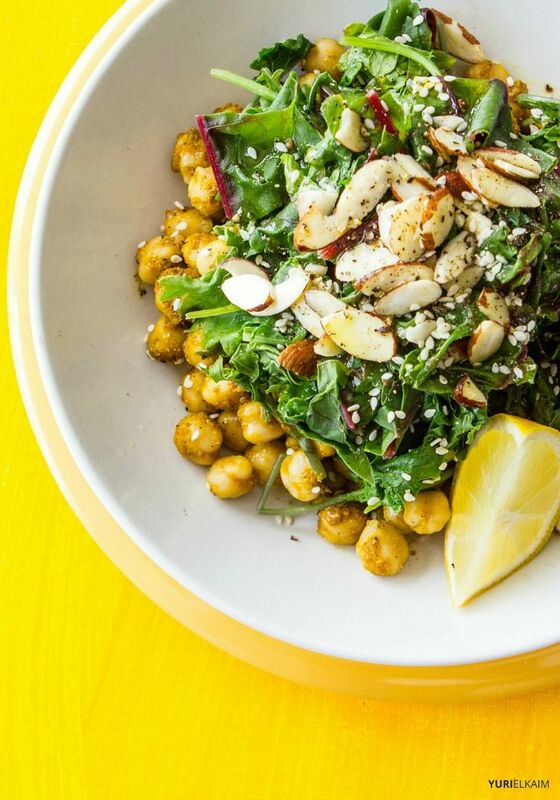 Why not get your kale on with this delicious Kale Curried Chickpea Salad Bowl recipe? It’s packed full of flavor and takes less than 20 minutes to prepare. Have you noticed a pattern yet? 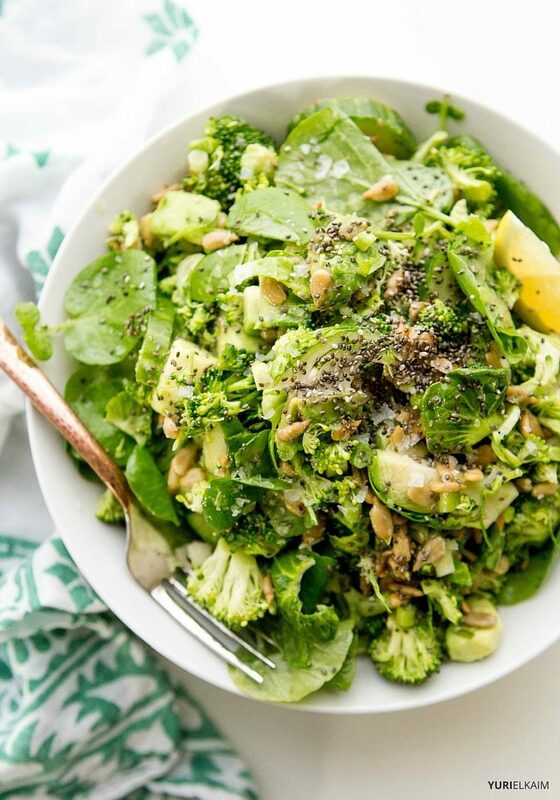 The world’s most alkaline foods are leafy greens. Swiss chard is another green that provides mega nutrition benefits with vitamins that support cellular health, such as vitamin K.
Swiss chard also contains phosphorus and plant protein, but based on its PRAL score, it leaves behind more alkalizing minerals than acidity when metabolized. I recommend using Swiss chard as hearty lettuce wraps, in any recipe that calls for a grain bun or tortilla. The Kitchn has a great recipe for Swiss Chard Taco Wraps with Cumin Lime Sauce. Although I recommend avoiding the optional cheese to keep this dish highly alkaline. Bananas, aka “Potassium Sticks,” are another highly alkaline food that you won’t want to leave out of your diet. Bananas are also a great source of fiber, which help promote digestive regularity and sweep toxins out of the gastrointestinal (GI) tract. While most people tend to avoid bananas to prevent weight gain due to their high sugar content, eating a banana is far better for you than eating a granola bar or some other processed food that’s packed full of sugar and acidifying ingredients. One of the most delicious ways to include bananas in your diet is by making banana “nice cream,” which is simply just frozen bananas blended into a creamy consistency. The best part about banana nice cream is that you can jazz it up with other alkaline ingredients, such as fresh mint leaves and berries. If you’re looking for some inspiration, here’s a recipe for my favourite Mint Cacao Chip Nice Cream. Now you can feel better about eating sweet potato fries (in moderation). Although they’re higher in starch, sweet potatoes are an alkalizing food that provides your body with plenty of fiber, vitamins, and minerals. Because sweet potatoes are so high in fiber, they have less of a negative impact on blood sugar levels, since fiber helps slow the release of sugar into the bloodstream. Therefore, sweet potatoes are an excellent food when it comes to eating for energy and providing your body with a boost of alkaline nutrients. 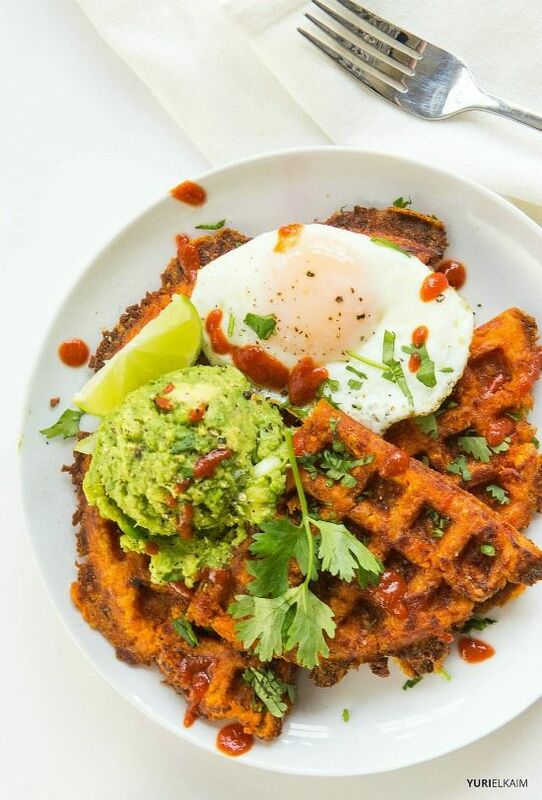 What better way to eat sweet potatoes, than in these 3-Ingredient Paleo Sweet Potato Waffles? You may think of waffles as a breakfast item, but I recommend saving complex carbs for your evening meals instead. Why? Because contrary to popular belief, eating carbs at night can actually help promote weight loss and help you sleep better. Aside from being alkalizing, celery has additional cleansing properties. Since it’s mostly water, celery can easily help the body flush toxins. Celery is also a “negative calorie” food, which means it takes more calories to chew and digest than the total amount of calories it contains. I include celery in a variety of my green detox juice and smoothie recipes. 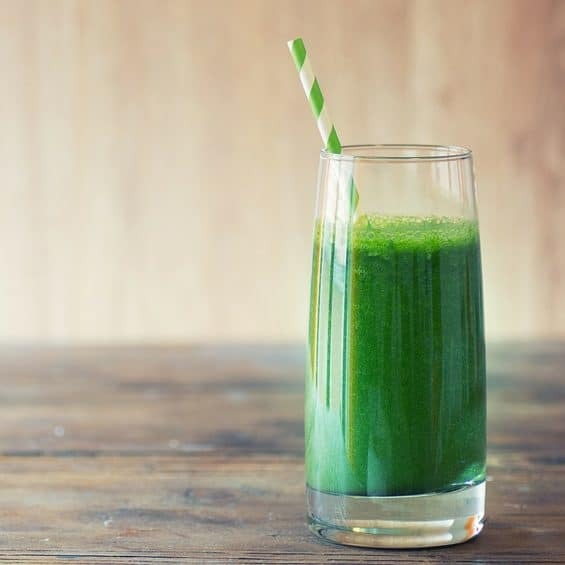 For a complete list my favourite no-fruit-added green juices, you can refer to my 7 Green Detox Juice Recipes right here. Carrots are a high-alkaline food that is famous for improving eyesight based on their vitamin A content. In fact, 1 cup of carrots contains more than 300 percent of the daily recommended intake of beta-carotene, an antioxidant form of vitamin A. Beta-carotene can also help protect against cancer and help promote brighter, younger looking skin. If you need some carrot inspiration, The Healthy Foodie blog has a delicious recipe with step-by-step instructions for a shredded coleslaw-esque Carrot Salad right here. Kiwi is a high-alkaline food your cells won’t want to miss out on, because it also contains a plethora of antioxidants, vitamins and minerals. And although oranges are famous for their vitamin C content, kiwi contains nearly five times the amount of vitamin C than an orange. Kiwi is also a great source of fiber for improved digestion, as well as potassium for muscle function. 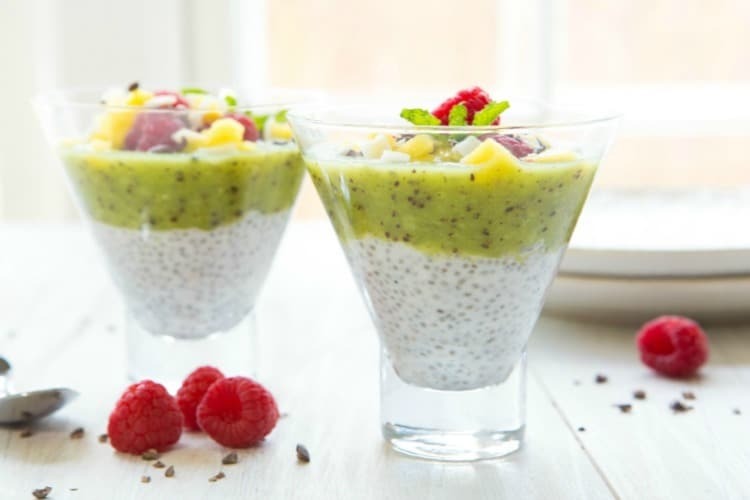 I feature kiwi as an ingredient in my Tropical Chia Pudding Parfait right here. Cauliflower is an alkaline food that can also aid in hormone rebalancing when the body’s estrogen levels are too high. This is because cauliflower contains a nutrient called Indole-3-Carbinol (or I3C) that helps the body regulate estrogen levels. 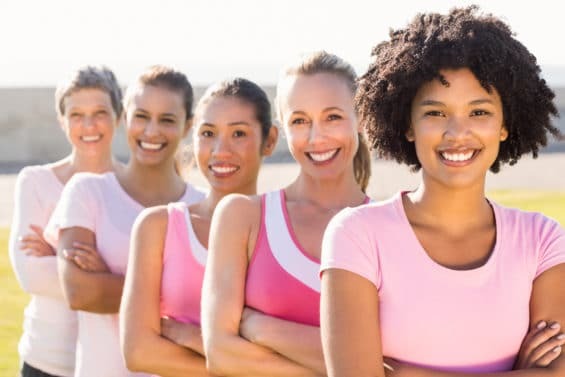 We come into contact with estrogen on a daily basis through estrogenic foods (such as soy), chemicals in our environment (such as plastics) and pharmaceuticals drugs (such as oral contraceptives) (9). 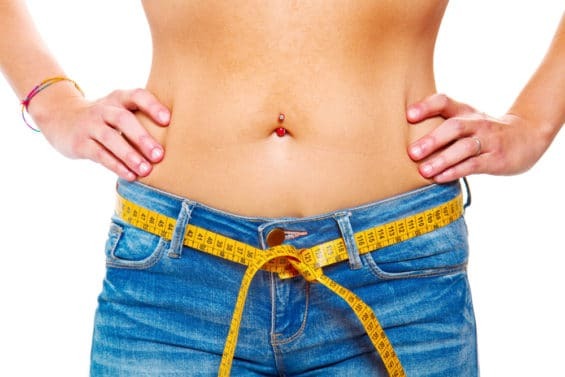 High levels of estrogen are harmful to the body and can lead to weight gain, digestive symptoms such as bloating, as well as reproductive cancers and infertility. A fun way and delicious way to eat more cauliflower is with this Slow Cooker Cauliflower Fried Rice. Cherries are known as one of the world’s best sources of antioxidants such as anthocyanins, which may help prevent cancer. Studies also support that cherries can help relieve inflammation linked to joint pain and arthritis, and may even prevent cardiovascular disease (10). Cherries blend well in smoothies, such as this blood-sugar-balancing Peanut Butter and Cherry Protein Shake. 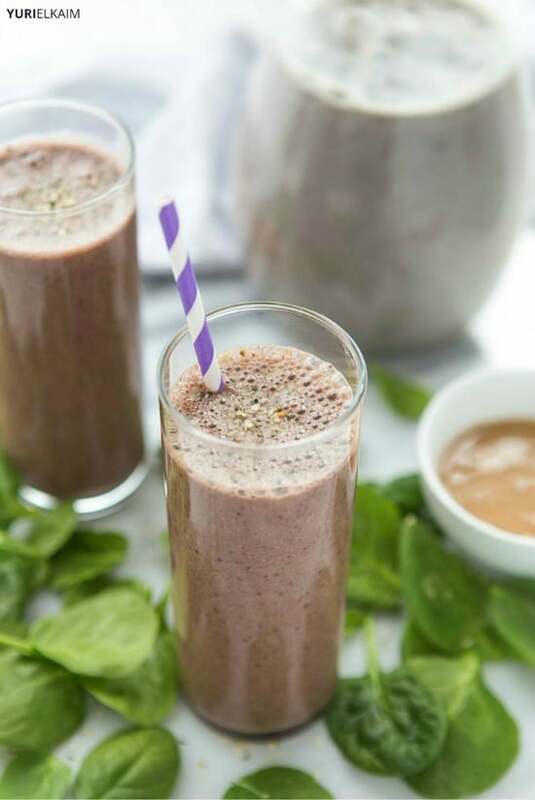 I recommend this recipe as a great post-workout shake because it contains both plant-based protein and alkalizing nutrients. Ideally, a post-workout shake should always include alkaline foods. This is because lactic acid, a substance that naturally helps increase the body’s energy, is naturally released during intense exercise. As suggested by its name, lactic acid can make the body acidic, which is why it’s important to neutralize the acidity with alkaline foods after a workout. In addition to being alkaline, eggplant is a food that offers phytonutrients such as chlorogenic acid. Chlorogenic acid isn’t acidifying to the body, rather it’s a plant compound that can help promote digestion and metabolism. Eggplant is delicious when it’s baked in a little bit of extra virgin olive oil, and added to salads, or used as a substitute for pizza crust in this 10 Minute Eggplant Pizza recipe. Pears are extremely high fiber and lower in sugar, which makes it a great fruit even for those who have blood sugar imbalances. Pears are also high in the antioxidant vitamin C, which helps protect cells from carcinogens. Here’s a recipe for an easy to make Pear Walnut Salad with a Mustard Orange Dressing. Most nuts have an acidifying effect, according to their PRAL scores. But hazelnuts are an exception. So if you love nuts, they’re an ideal variety include in your diet in comparison to peanuts, which have a score of +8 and are highly acidic. Hazelnuts are best known for their contribution to the infamous nut butter, Nutella. 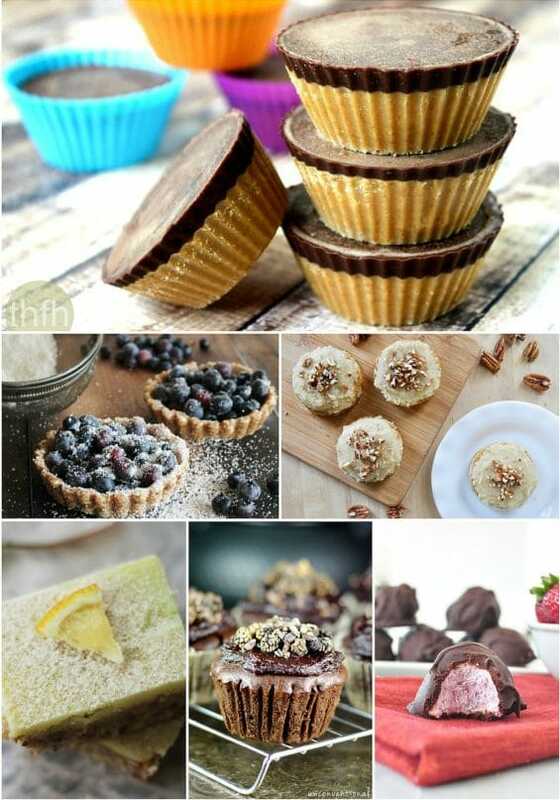 However, I recommend avoiding store-bought Nutella and making your own refined-sugar and additive-free version with Chocolate Covered Katie’s Healthy Nutella recipe. Pineapple is an alkalizing food that’s so good for digestion that several supplements add it to their digestive-boosting formulas. This is because pineapple contains a digestive enzyme called bromelain. Bromelain is also said to be helpful for killing off intestinal parasites. You can add more pineapple to your diet in many different ways. 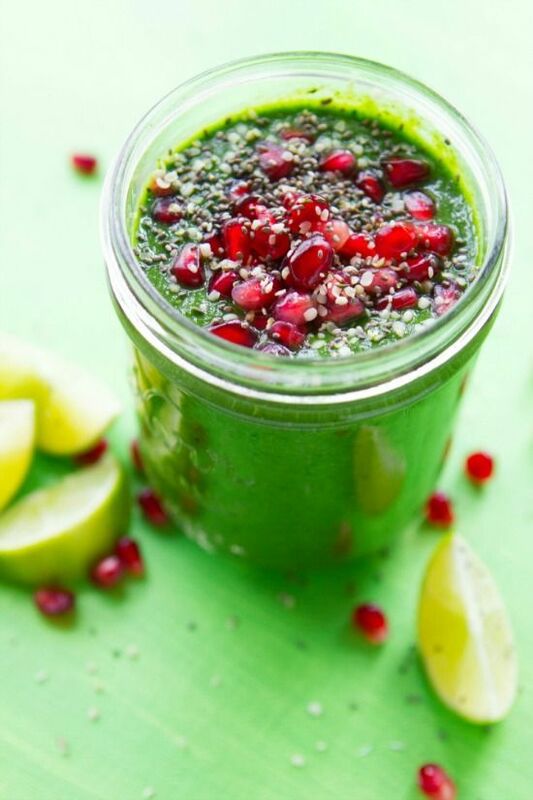 It would pair especially well with the rest of the alkalizing ingredients in my recipe for this Super Green Cleansing Smoothie. Zucchini is a great source of phytonutrients such as lutein. Lutein belongs to the same category of antioxidants as beta-carotene, which means it also has superior benefits when it comes to protecting eyesight. Zucchini has become extremely popular as a low-carb, gluten-free and vegan pasta alternative. You can make zucchini pasta noodles using a Vegetti spiralizer that can be purchased online or found at your local home accessories store, for under $20. My recipe for this One Pot Wonder Tomato Basil Pasta combines zucchini pasta noodles with vegetables, fresh basil and other aromatic, zesty spices. Not only is it an alkaline food recipe, but it’s also extremely easy to make (and tastes delicious, of course). Strawberries are another extremely rich source of the antioxidant vitamin vitamin C. They also contain manganese, which is a trace mineral that’s needed to facilitate metabolic function in the body. The ways to enjoy strawberries are endless, as they can add just the right amount of sweet to any dish. 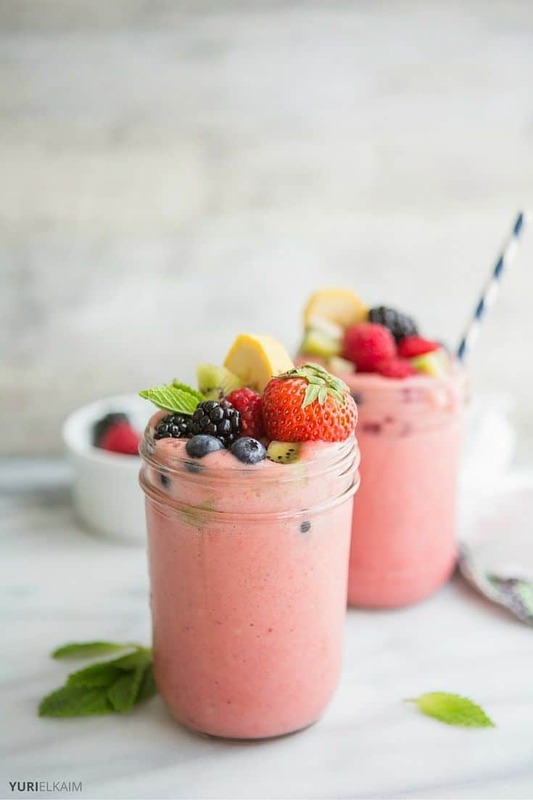 I personally love using strawberries in this Strawberry Banana Smoothie recipe. Apples have a reputation as one of the healthiest foods in the world, mostly because they’re so rich in detoxifying fiber and antioxidants such as vitamin C and flavonoids that protect against cancer. All of these nutrients are also essential for promoting healthy blood pressure and cholesterol. To get even greater health benefits from apples, I recommend adding apple cider vinegar to your diet each day. When fermented to make vinegar, apples contain a nutrient called acetic acid, which offers antibacterial and antiviral benefits (11). If you don’t like the taste of apple cider vinegar on its own or diluted with water, that’s okay. There are several ways to make apple cider vinegar taste so amazing, you won’t even notice the slightly sour taste. This Apple Cider Vinegar Detox Soda Drink recipe is naturally sweetened with lemon and stevia, and makes the perfect healthy substitute for fizzy beverages that contain several teaspoons of refined sugar and other acidifying ingredients. Lastly, watermelon is another alkalizing food that provides the body with essential electrolytes for cardiac function, such as potassium. Since watermelon is mostly water (hence the name), it also hydrates us more than most fruits and vegetables. Watermelon makes a delicious snack on its own, but sometimes it’s fun to get creative. Here’s a recipe for my Summer Watermelon Detox Juice that is packed full of flavor with added ginger, jalapeno and honey. 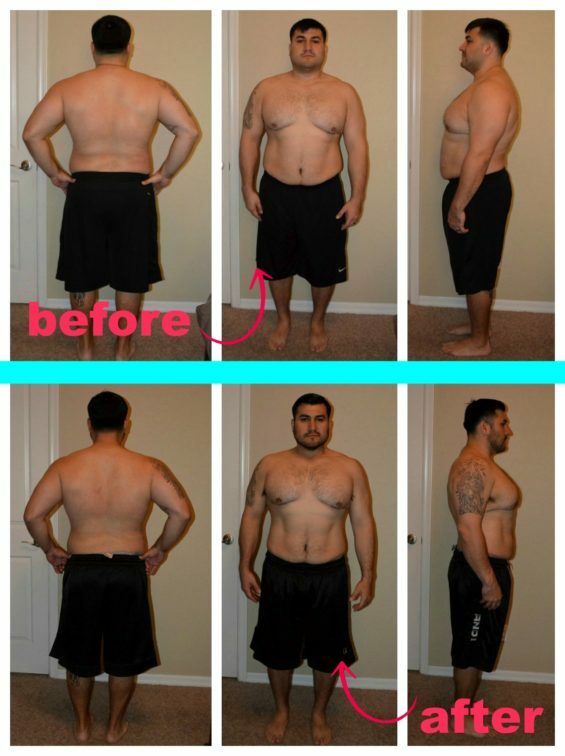 As you can see, eating an alkaline diet doesn’t have to be extreme or difficult. Trying new plant based recipes, such as the ones listed above, are one of the easiest ways to start increasing the amount of alkalizing foods you incorporate in your diet each day. From eating a highly alkaline diet, you can expect to receive more energy, better mental focus, a stronger immune system and an overall greater sense of well-being as you tackle life’s challenges each day.